On Saturday, I woke up with the urge to take a walk. It's probably because I felt something shaking near my waistline on Friday while I was laughing. It made me think of Santa and his round little belly that shook like a bowl of jelly. I'm a frustrated, out-of-commission runner, with an unidentified and thus untreated hip/leg/ankle injury that has kept me from running since I ran the NYC Marathon in 2009. I haven't been able to run or walk briskly without pain, but Saturday I felt very compelled to try going for a walk. On the very next block of my street, there it was... an estate sale sign. I hardly ever go in to estate sales or garage sales, but I've been wanting to build my stash of old buttons for a project I'm working on and I decided to go in just to see if by chance they had any buttons. Long story short, here's what I came home with. A 1939 Singer 66-16. 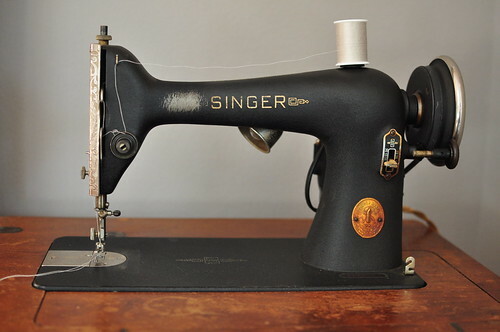 I was able to date her using her serial number on the Singer website. The gentleman holding the estate sale was the son of the home's owner who has moved into an assisted living facility. She's 97 now and bought this machine new. I'm only it's second owner! She's in pretty good shape with the exception of the power cord (which is a little frayed in places) and the scratches on the front where the previous owner stored pins on a piece of velvet wrapped around the upper shaft. I spent all day Saturday taking the machine apart to clean and oil her parts. She sews so beautifully! I still need to fiddle with the bobbin tension a little, but as soon as I replace the power cord (so I don't burn down my house), I'll be more comfortable keeping her plugged in for a while so I can make more adjustments. This little pink lady also came home with me. I've read online that Atlas was a "badge" placed on machines built for Brother in Japan in the 1950's. I couldn't resist; I mean, she's pink! The previous owner bought this machine when she decided to upgrade from the Singer. From the scratches, grease, and grime on this machine, I can tell it was used a lot. 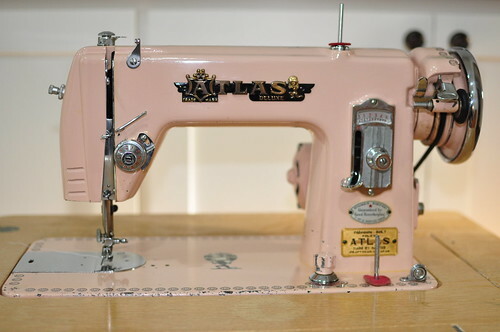 The Atlas is a straight-stitch machine too, but she has a reverse and you can drop the feed dogs. I spent some time working on her too and she sews a very lovely straight-stitch, but not quite as nice as the Singer. and a tin of sewing supplies with a few buttons inside. That tape measure advertises Hanes Union Suits on the backside. Both of the sewing machines are in cabinets, but unfortunately, I didn't get the manuals or any attachments. I have no idea where I'm going to store them and maybe I don't even need to keep both, but I know I'm keeping the Singer. I told the homeowner's son to be sure and let her know that her machines had gone to someone who will appreciate them and that they didn't even leave the street they had called home since the early 1940's. And no, I never did finish taking that walk. I'm jealous of those pretty wooden spools! Seriously Jealous! 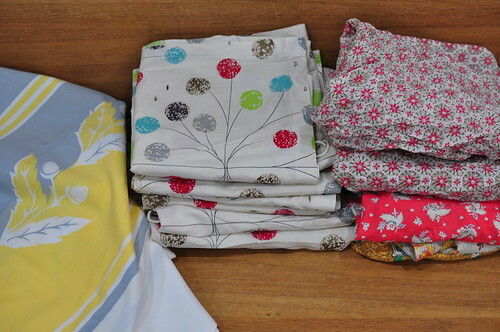 The machines are great and those fabrics are awesome! Love the tins with the spools! I love the pink!Happy sewing!!! WOW that Singer is so beautiful. Isn't it cool you are only the second owner?!? Girl you made a haul! I never find things like that!!! I love the pink machine! Seriously if you descide to pass it on you keep me in mind!I am a pink fanatic! I would be interested in talking! Lucky you! I think my favorite part is what you said about being the Singer's 2nd owner and keeping it on the same street. We have a formica table like that (we're its 2nd owner) and it made me happy. Wow- those are amazing finds! You are one lucky lady! Love those old machines. I've got at least 6 old Singers that I absolutely adore. Congratulations on your finds!!! Oh, I'm so jealous over the notions! 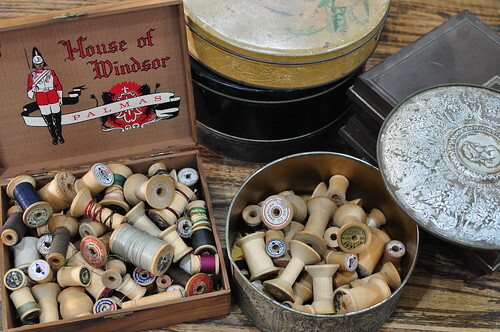 I LOVE finding old notions like thread, buttons, etc. They are so much fun!! I love your vintage finds. 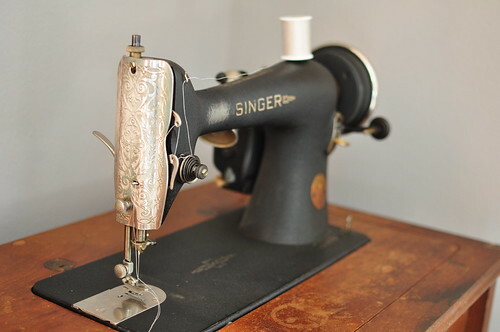 I have my grandmother's (or possibly add a great in there) Singer with the handle on the wheel to turn by hand - it sews beautifully albeit rather slowly....but I'm using my mother's Bernina now. Wow, you had the best kind of walk imaginable. What fantastic finds!! Wow you hit the mother lode! I would keep both machines, I mean the pink one is sweet and they are a set! Sewing machine cabinets make nice end tables, servers in dining rooms or kitchens. My White-in-a-cabinet is a server in my kitchen until I move to a larger home where I can have room to open it and use it again. BTW I love finding boxes and tins of vintage sewing stuff! I'm thinking you probably got lots of exercise jumping for joy!! Oh what goodies!! I'm just a teensy bit jealous!! Wowwwww! Those wooden spools are delightful!! What an amazing haul! We need to keep those vintage sewing machines out of the hands of AllSaints' just to use for 'window dressing'! WOW! What an awesome day of thrifting - great finds! Yeah! I picked up a 1913 treadle Singer that was buried in a yard sale barn a while ago. In fact it was my frist "machine", though foot powered. I'm going to throw it a big B-day party when it's 100! I just discovered Texas Freckles through Google Reader. What a lovely blog! I know how frustrating a running injury can be. I'm sure you hear a lot of remedies, but at the risk of being repetitive, let me offer the solution to my running issues. I have been using a high density foam roller (http://www.power-systems.com/p-3027-high-density-foam-rollers.aspx) for hip flexor issues for a few weeks now. Before using it, I could barely walk without pain in my knee or hip. After using it just once to loosen up my hip flexor, I had no more pain. I've been using it daily since and continue to be able to run without pain during or after. Just thought I'd pass this information along! I love the old Singers. My neighbor's 201-2 came home with me several years ago...it, too, resides within one block of its original residence. 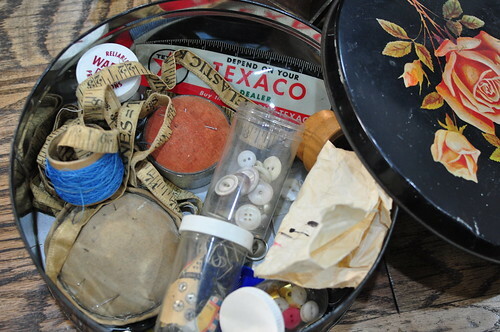 I am so jealous of all your finds...tins, vintage machines, wooden spools! I want to live on your street!